January and February price action established the barriers to a clear and concise trading range between 2,872.87 and 2,532.69. Trading ranges are notoriously difficult to forecast as they're best described as wild oscillations confined between obvious levels of support and resistance - and that's arguably the best description of what transpired over the month of March. March recorded as an "inside month" i.e., March's monthly high (2,801.90) was below February's high (2,835.96), and March's monthly low (2,585.89) was above February's low (2,532.69). On the chart, this places the monthly high, low, close (HLC) bar "inside" the prior month's HLC bar, hence the term "inside month". Ironically, the final trading week of the month finished as a perfect synopsis for March. The S&P 500 would gain 2.43% on Monday, lose -1.73% on Tuesday, fall -0.29% on Wednesday, and finish the week by increasing 1.38% - all while trading below the high of the week prior (2,741.38) and above the low of the week prior (2,588.26). We ended an "inside month" with an "inside week". Go figure. Spring is in the air and if March stayed "inside", it would appear April's ready to play "outside". Since 1970, there are 53 prior samples of "inside months" for the S&P 500 (March is number 54). The subsequent calendar month was another "inside month" only twice, or 3.7% of the time. The subsequent calendar month also traded above the high or below the low of the month preceding the "inside month", which in this case would be February's high and low, 35 of 53 samples, or 66% of the time. Therefore, it's highly likely the S&P 500 either trades above March's high at 2,801.90, or below March's low at 2,585.89, in April. It's also more likely than not that April either trades above February's high at 2,835.96, or below February's low at 2,532.69. Range expansion is likely on deck in April, even if it's just temporary. In my opinion, the path of least resistance in clearing the "inside month" for April is to the downside, or a trade below 2,585.89. I come to this conclusion in part based on the relative distance between March's close and its monthly high and monthly low. It will take just a -2.09% monthly drawdown in April for the month to tick below March's low. Alternatively, it will take a 6.10% monthly drawup to tick above March's high. When analyzing the forward 1-month drawdown and drawup following "inside months", 33 of 53 samples experienced a monthly drawdown of -2.09% or worse, or 62.26% of the time, while only 11 recorded a monthly drawup of 6.10% or more, or just 20.75% of the time. The market can and will trade however she wants, she often trades beyond the limits of human imagination, but I don't think it's an unreasonable assumption that April's "inside month" clears to the downside. However, there is a plethora of evidence that suggests the price of the S&P 500 won't then stay below March's low. In terms of forward 1- month returns following "inside months", the S&P 500 has closed higher 40 of 53 samples, including each of the last 8 instances. That's a 75% win rate with average and median returns of 1.42% and 1.68% respectively. Both average and median returns are above the average and median forward 1-month returns for all calendar months since 1970 (0.69%/0.93%). The path the market travels over the forward 1 month to generate these returns is hardly different than the path the market travels over any and all calendar months since 1970 (i.e., the month following an "inside month" hasn't historically seen an uptick in high-low range). The median forward 1-month drawdown following "inside months" is -2.80%, while the median forward 1-month drawup following "inside months" is 3.23%. Therefore, on their own it would appear that "inside months" have historically had somewhat of a bullish bias over the forward 1 month, both in terms of win rate and above average returns. If these median figures come to fruition, we'd see April trade down to ~2,566, trade up to ~2,726, and close the month at ~2,685.23. The sequence of these events is of course the wildcard. Obviously, bullish participants would prefer to see this occur sequentially (i.e., trade down to ~2,566 first, then move up to ~2,726, and finally close the month at ~2,685). Given how wild things have been, I do anticipate a larger range in April. This sequence of events aligns well technically as there is a plethora of potential support levels across a variety of time frames sitting below March's low in the 5% range from ~2,450 to 2,585.89. On the daily chart, we have the ultimate "re-test" at February's low of 2,532.69. 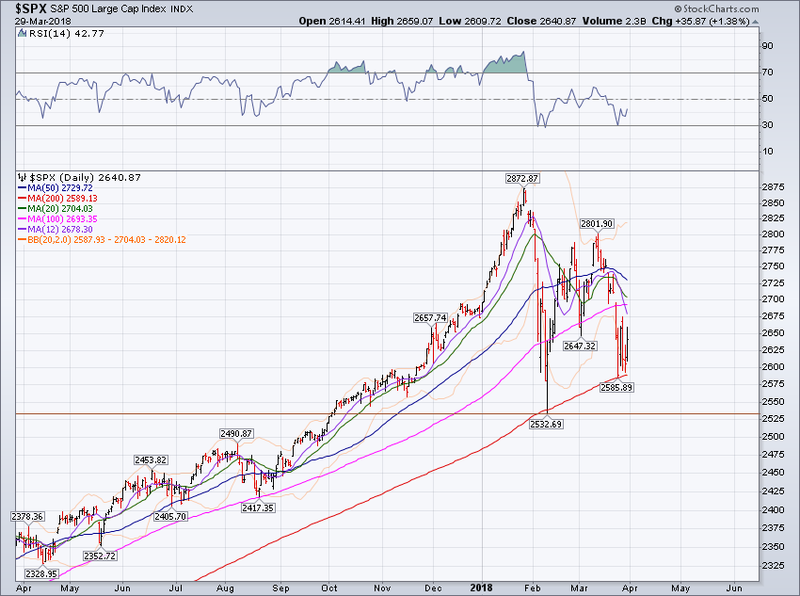 A trade down toward ~2,532 would serve to clear out the pending trading activity below the 200-day simple moving average, and likely lead the market on a direct path to the level where the next highest trading activity probably resides - 2,532.69. On the weekly, we have the 50-week simple moving average at ~2,560, the lower weekly Bollinger Band at ~2,545, and the 50% Fibonacci retracement at ~2,478, when connecting the vicinity of November 2016's pivot low to January 2018's all-time high. On the monthly, we have the 12-month simple moving average at ~2,580 and the 20-month simple moving average at ~2,460. We also have the 38.2% Fibonacci retracement at ~2,470, when connecting the vicinity of February 2016's low to January 2018's all-time high. It's also an interesting observation to note that our last major swing low at 2,083.79 landed almost exactly on both the 12- and 20-month simple moving averages. As always, none of these levels I've shared are consistently predictive: Price doesn't have to equal or decline to any of them and there's no guaranteeing what price will do if any or all of these levels are actually reached. They're simply objective levels of potential support that may bring uniform trading behavior across market participants (i.e., eager buying interest arrives, shorts cover, buy imbalance ensues, price thrusts higher). So, if in fact we do trade below 2,585.89 in April, these are some of the levels to watch for a potential bottom that we can then trade or invest against. Now, with the Volatility Index (VIX) hovering around 20, prices will move fast. As I've mentioned, I think there's a compelling argument to be made that April's low is below March's low, and I think there's also a compelling argument to be made that April's close is above March's close. In addition to the historical upward bias the month following "inside months" have shown, the S&P 500 has also loved the month of April as of late. April has closed higher 5 consecutive years, 11 of the last 12, and 32 of 48 since 1970. Also, since 1950, if January closed the month positive, then April has closed positive 33 of 41 samples, an 80.4% win rate. (courtesy of Wayne Whaley. If you like my work, you'll love his. Sign up at www.witterlester.com). Seasonally speaking, there's a tailwind behind April's back, and there's certainly an upside catalyst via earnings season potentially coming in above expectations. 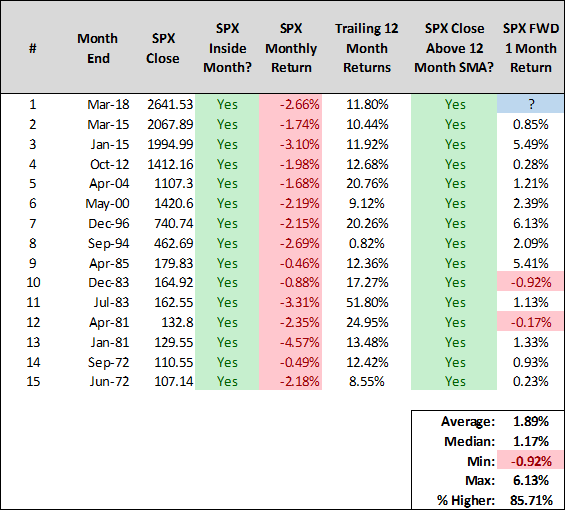 Lastly, if I filter "inside months" to add three parameters that match our current price action (the "inside month" closes red, above the 12- month simple moving average, and with positive trailing 12-month returns), we're left with 14 samples. Of those prior 14 samples, the S&P 500 has closed higher 1 month later 8 consecutive times, and 12 of 14, for average and median returns of 1.89% and 1.17% respectively. While these returns aren't overly impressive, and they're no different than what's transpired following all 53 prior "inside months", they're measured from close to close, and not from monthly low to close. This helps support my bias towards buying the dip if we do bend in April, since there's perhaps stellar returns to be made if indeed April's low trades below March's low, but April's close finishes above March's close. After all, history suggests the most likely outcome is that the S&P 500 bends...but it won't break. As always, an exciting month awaits.